Lately, Marty has been objecting to using his pen for evening feed. This has been quite frustrating, bearing in mind that he has gone into the same pen to be fed twice a day, every day, since he came home five months ago. It shouldn’t be a problem. But what started out as slight hesitation turned into needing to be coaxed in, and then became a refusal to go in at all. Apparently he wasn’t talking to me that day. I haven’t changed anything. He didn’t come into the pen and have a horrible experience; he’s getting the same food; I haven’t started feeding earlier/later than normal. He seems genuinely anxious about going in, and will often stand and boggle at the hill field on the other side of the fence instead. Ben is also super scary, but that’s standard. I voiced my bewilderment to Ben, who thought about it for a bit and then suggested that when the spotlights are on at the house, they cause the equines to cast long shadows – shadows that stretch out over the hill field, across the pond and up the trees of the copse that lies beyond. This would mean that when Marty approaches his pen, he can see something moving down there but can’t figure out what it is. 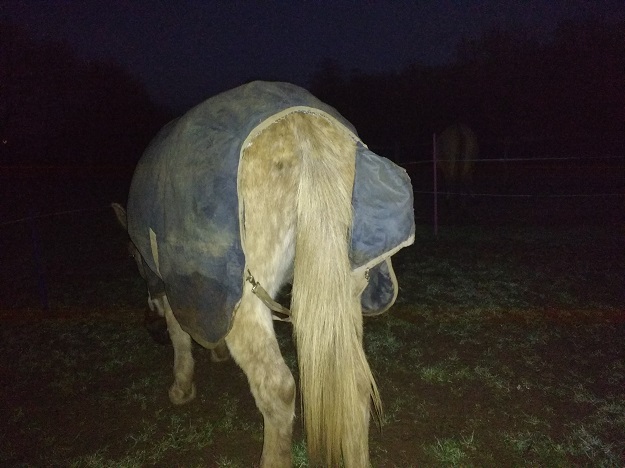 Initially I dismissed this, because the house has always had spotlights and they’re not a new thing; but for the last three nights, the spotlights have been off and Marty has walked into his pen without issue. He is a perplexing little fellow! We ran out of grass shortly after Christmas, and have been trying to find ways to keep life interesting for the herd now that the track is gone. 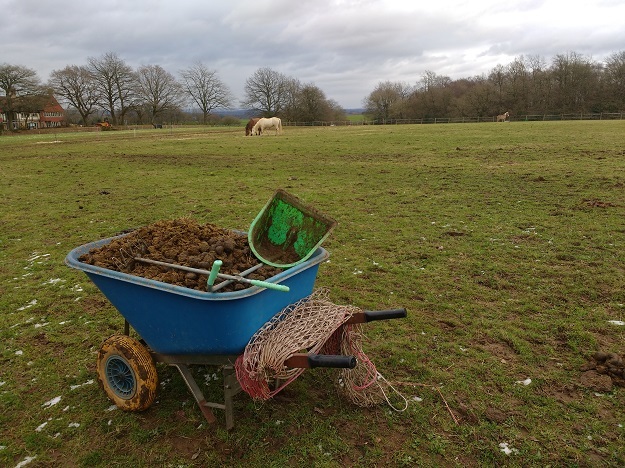 We did briefly consider putting a track back up, partly to keep them moving and partly because it is a lot easier to poo pick a track than a big, open field! But in the end we decided that the mud and our yard owners’ ire wasn’t worth it. And this is why I don’t need to go to a gym. 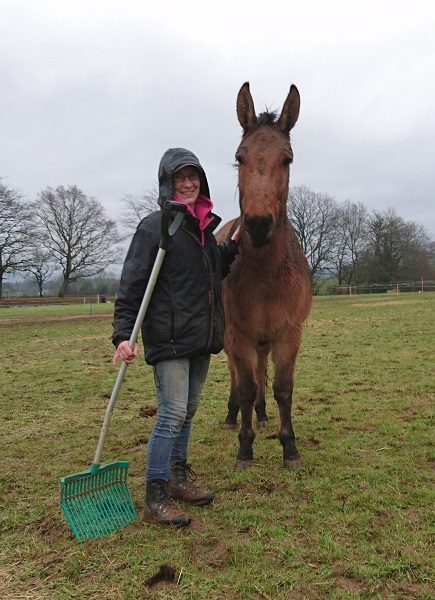 A little while ago I decided to introduce the mules to brussel sprouts. 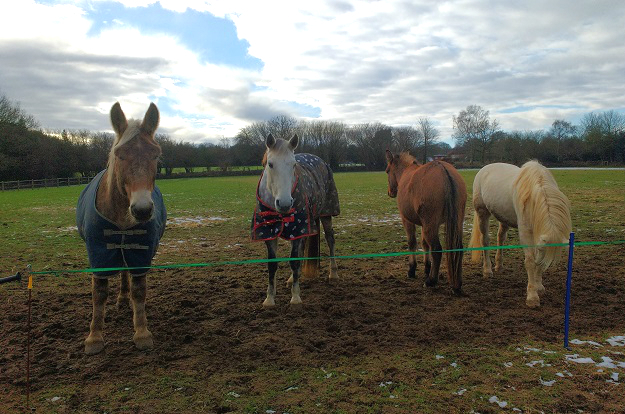 Around Christmas time you can buy sprouts on stalks, which are great pony toys (we only feed small amounts, infrequently). 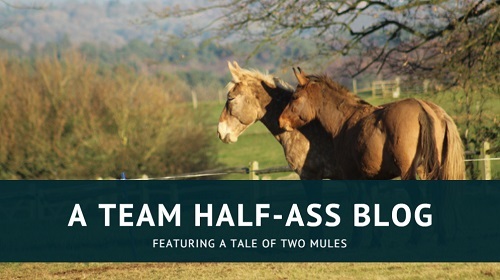 I wanted to see what the mules thought of them. Xato thought the sprout stick was great, until I made the mistake of putting it on the floor, and then it was tainted and unworthy of a golden mule’s interest. Marty did not like the sprout stick at all thank you very much, but he was quite keen on the game where I roll individual sprouts along the floor for him. More recently, I decided to add a little extra enrichment by hanging the stalks in the field. I’d hoped to use a tree branch but wasn’t tall enough to reach! The fence had to suffice. 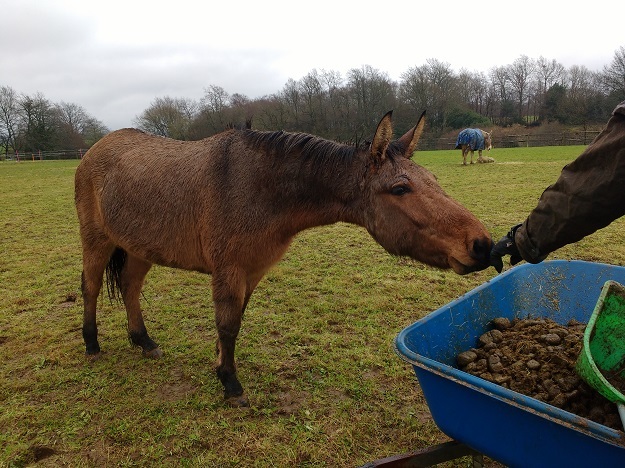 Much to my surprise, Marty was the bravest of the lot and – after trying, failing, and thinking long and hard about his problem – he eventually plucked up the courage and had a tasty meal while the rest of the herd stood around looking baffled. Xato also had a go, once Marty had tested to make sure it was safe. I think his concern centred around the wire along the top of the fence, which is usually electric – I think he must have zinged his ears on it at some point. I do love that top lip of us. Earlier this week, I’d stopped petting him and had turned away to pay attention to whatever Marty was doing. Xato hovered hopefully behind me, waiting for it to be his turn again, and then he reached his top lip forward and gently patted me on the shoulder with it. I know I’m anthropomorphising, but it was a lot like having someone tap you on the shoulder when they want your attention! While I’m sharing videos, here’s one I’m particularly pleased with: I managed to get Xato’s rather unique bray on video! Isn’t he glorious?